It’s late, but it’s technically still Monday, at least where I am, so this blog still counts as a Monday post. I actually have a dozen or so different types of chocolate I’m dying to dig into. They all look so yummy, that I’m having problems deciding which box to pry open first. 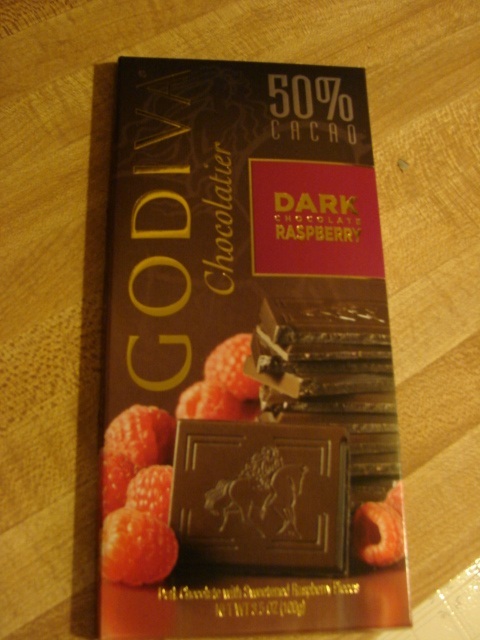 Since several of my options are actually from Godiva (what can I say, my friends and family know me well), I figured I should start with one I bought myself. Recently Godiva had a sale on their fairly new oversized chocolate bars. I was already wavering on whether or not to throw the salted caramel bar on my already growing pile, but since I’d already had quite a stack, I put it back. But when I saw the sign that said 3 for $10, I figured what the heck, let’s try several of them after all. Since I have always been a huge fan of the raspberry/chocolate combo, I thought that should be my first choice. Despite being a dark chocolate, it’s only slightly bitter with crunchy little bits of raspberries imbedded in it. 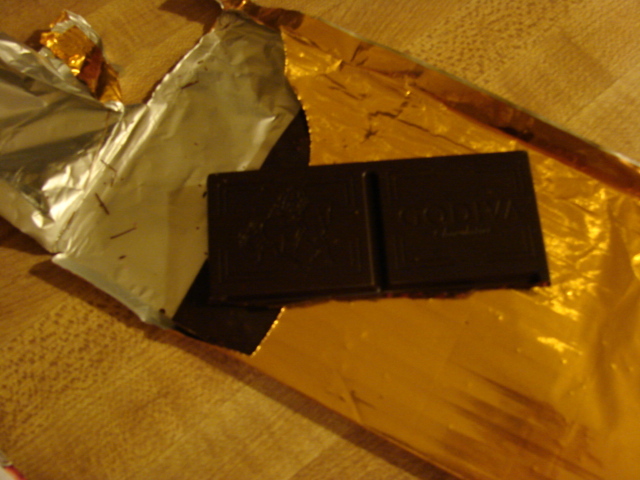 The freeze-dried raspberries gave the bar a slightly tart crunchy texture. The little berries make the chocolate a tad tastier, but try as it may, this one doesn’t live up to the original tiny bar they make. The smaller version has a liquid center, similar to the raspberry cordials I adore. 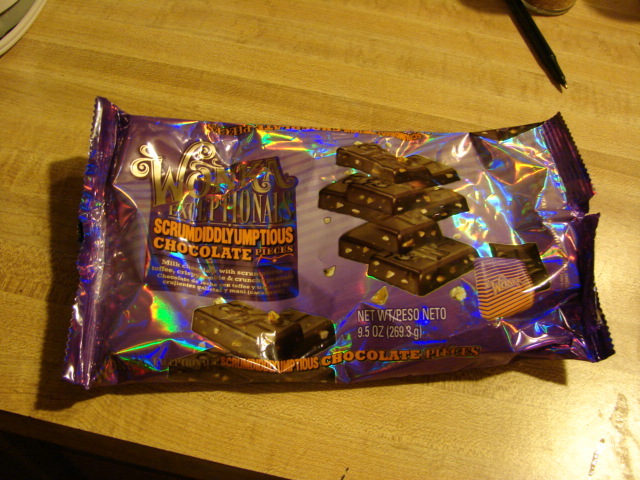 This version was better than the plain dark chocolate, but just disappointing. I ac tually found I liked it better when I let it slowly melt in my mouth. But still, it wasn’t enough to hold my interest for an entire bar. Had it been half the size, I might have finished it. But alas, it will be snuck into my husband’s lunch bag where he will indiscriminately gobble it down. I know, I know, I’ve been gone for a long time. Turns out having two small children, a full time job with TONS of grading and friends and family I don’t want to avoid takes up a lot of time. I know that’s not a surprise to most people, but I haven’t quite adjusted to two kiddies yet. My early resolution is to not let myself get so behind (or stressed) that I let this blog go again. Not saying it’ll happen for sure, but I’m going to try really hard. Any kid who had any sort of a childhood loves Willy Wonka. I’m not sure if I read the book first or saw the movie (I’m old school, I not only grew up on but still adore the Gene Wilder version), but from the instant I was introduced to Wonka, I was obsessed. I’m not sure how many times I’ve seen the movie (although I know I’ve read the book three times), but even as an adult, I still fantasize about being unleashed in that chocolate room for an hour or so. Sure, now that I’m older, I can tell most of it is plastic and only very certain pieces have anything actually edible on them (and don’t even get me started on the chocolate “river” that really does look like dirty water), but when I close my eyes and hear Wilder sing “if you want to view paradise,” I’m suddenly 10 years old again, and that room holds nothing but delicious treats. 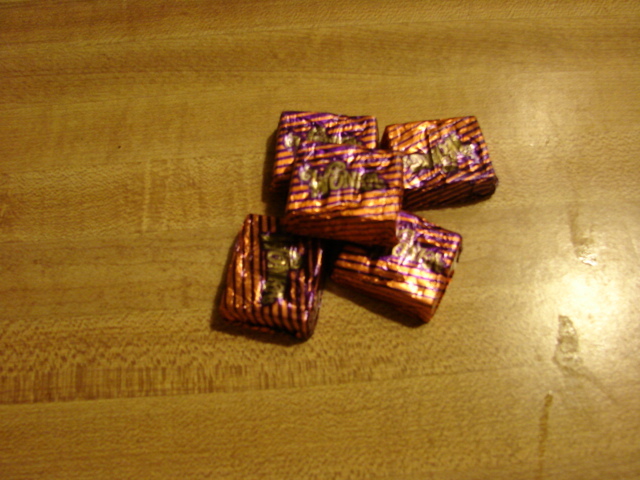 So, when my husband brought home a bag full of bite-sized Wonka Exceptional Scrumdiddlyumptious Chocolates, just like Augustus, I was ready to dive right in. Amazingly, despite my love of the novel and the movie, almost all my Wonka candy experience has been of the sugary sweet variety. Everlasting Gobstoppers, Tart n’ Tinys, Runts, Sprees, Sweetarts and Pixy Sticks were my vices. It wasn’t until adulthood that I had any Wonka chocolate. Heck, I’m not even sure when they started actually cashing in on the chocolate aspect of their legacy. To look at their website, it appears they actually only make three different chocolate bars (and bags with mini versions in them). It kind of seems like a waste to me since the movie practically handed them a chocolate empire on a silver platter, but then, I just review chocolate, I don’t have to come up with the recipes for it. I wasn’t sure what to expect from something with such a mouthful of a name. Turns out I should have expected just that: a real mouthful. The chocolate was a bit busy with toffee and cookie bits and peanuts. It really lost any distinct flavor since all the ingredient flavors were competing with each other. I could feel the different bits in the texture but none of them hand a stand out taste. I felt like I was eating crunchy chocolate. Only I couldn’t identify the crunch at all. The chocolate itself was creamy, but didn’t live up to the promise of my childhood movie fantasies. It was scrumdiddly to be sure, but the umptious is a real stretch. It was more like the movie as viewed through my adult eyes: a bit of a candy let down. The taste reminded me a bit of something that could have been made using that chocolate waterfall. They were definitely fun to try. I liked having a bit of my childhood to snack on. If I’d eaten them when I was 8, I would have loved them. As an adult who has tasted some mighty fine cocoa tidbits, I do not. Ok, but not worth spending my own dough on. Good thing they were a gift.